Bar Keepers Friend’s Toilet Bowl Cleaner’s extra thick formula cleans and deodorizes, and removes rust and lime deposits! If you have well water, older plumbing, or heavy iron content in your water, you may notice unsightly brown, orange, or rust stains in your toilet bowl. When iron concentrates in the water that drains into and out of your toilet, rust stains develop and become deeper over time. If expensive plumbing or filtration systems aren’t in the budget, Bar Keepers Friend Toilet Bowl Cleaner can help keep toilet stains at bay. How can I remove rust stains in toilets? To restore a clean, bright finish and remove rust stains in your toilet, Bar Keepers Friend developed a specially formulated Toilet Bowl Cleaner. Designed to dissolve and remove even the most stubborn toilet stains, our Toilet Bowl Cleaner’s extra thick formula cuts through rust and lime stains to thoroughly clean and deodorizes the bowl. 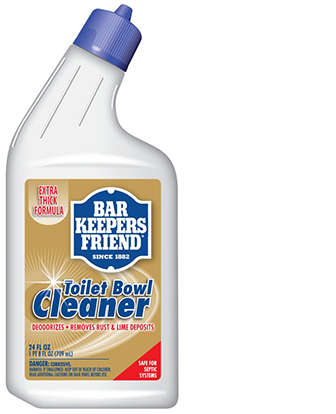 How is Bar Keepers Friend Toilet Bowl Cleaner different? Standard cleaners can’t completely cut through the build-up of lime and rust stains in the toilet. Bar Keepers Friend formulated our uniquely thick Toilet Bowl Cleaner specifically to address stubborn toilet stains. Our product thoroughly dissolves and removes rust stains in toilets, restoring the original color and finish while also cleaning and deodorizing. Hold bottle firmly with one hand while pushing down on the child-proof cap and turning counter-clockwise. Avoid squeezing the bottle as you open it. Raise toilet seat and remove excess dirt and grime with a toilet brush or scrubbing sponge. Flush the toilet to wet all surfaces. Apply approximately six ounces of Bar Keepers Friend Toilet Bowl Cleaner to all sides and surfaces of the toilet bowl, including under the rim. Replace bottle cap securely and allow product to sit in the toilet bowl for at least five minutes. Do not close toilet bowl lid during the soaking process. Brush the bowl thoroughly with a toilet brush and flush. Rinse brush in fresh water after use. Repeat if necessary. For best results, use Bar Keepers Friend Toilet Bowl Cleaner frequently. Eliminate rust stains in your toilets with specially formulated Toilet Bowl Cleaner from Bar Keepers Friend. Water, Hydrochloric Acid, Thickening Surfactants, Fragrance, and Colorant. This product is not EPA registered and does not make any claims to kill bacteria or any microorganisms. Keep only in original packaging. Wear protective gloves and eye or face protection. Wash hands and any exposed skin thoroughly after handling. Do not eat, drink or smoke when using this product. FIRST AID: IF IN EYES: Rinse cautiously with water for several minutes. Remove contact lenses, if present and easy to do so. Continue rinsing. Immediately call a doctor or poison control center. IF ON SKIN (or hair): Take off immediately all contaminated clothing. Rinse skin with water. Wash contaminated clothing before reuse. Immediately call a doctor or poison control center. IF SWALLOWED: Rinse mouth. Do not induce vomiting. Immediately call a doctor or poison control center. IF INHALED: Remove person to fresh air and keep comfortable for breathing. Immediately call a doctor or poison control center. PHYSICAL AND CHEMICAL HAZARDS. Do not use or mix this product with other household chemicals such as ammonia, toilet bowl cleaners, rust removers, acid, bleach or strong oxidizers, as this releases hazardous gases. Avoid contact with clothes, fabrics or carpet. STORAGE AND DISPOSAL: Store locked up. Transport and store in an upright position and in the original container. Dispose of in accordance with all applicable federal, state and local regulations. Do not reuse empty containers – flush with water and place in appropriate trash or recycling receptacle. Contains no phosphorus. Rinse immediately after use on metal to avoid pitting or discoloration. Avoid contact with clothes, fabric, wood, rubber, carpet, painted and papered surfaces and finished floors. Prolonged contact with metal, old porcelain, laminate tops and marble may cause discoloration. Bar Keepers Friend tackles the toughest cleaning jobs? Visit our Before & After page. Real people, real problems, real clean.